When America Singer is chosen from a lottery of all eligible females in Ilea to compete with thirty-four other young women for the hand of Prince Maxon, she's far from pleased. Most girls would kill for a chance to be the next queen of Ilea, but America would be perfectly happy marrying Aspen, the boy she’s been secretly seeing who is a caste below her. Even though she's in love with Aspen, competing means her cash-strapped family will be compensated, so she heads to the capitol with the hope of simply being sent home after a few weeks. What she doesn't account for forming an alliance with Maxon, discovering just how precarious the Royal Family's situation is, and finding that she may have a place at the palace after all. The Selection is an intriguing book that combines a futuristic setting and the very real romantic and relationship drama. It's been described as a dystopian The Bachelor, which might not be a favorable comparison for some readers, but readers will be happy to find that The Selection doesn't focus on a lot of silly drama. There are makeovers and pretty dresses and the requisite mean girl, but Cass thankfully doesn't let the narrative get bogged down in cattiness. America is genuinely nice and her goal isn't to win, which leads to some interesting scenes with the other girls as her unusual relationship with Maxon causes some tension, but thankfully it isn't overwrought. Cass gradually builds the world of Ilea as America is exposed to life at the palace where knowledge of history, social issues, and politics are a requirement. The most exciting part of the novel isn't the romantic drama, but the attacks on the palace and the question of what it is that the rebels would risk lives in order to obtain. There are a lot of loose ends at the conclusion of The Selection—the motivations of certain characters are unclear, a princess still hasn't been chosen, and America finds herself conflicted over not just Aspen and Maxon, but in which direction her life should take. Cass has crafted an easy to read and engaging story that will find popular footing with female fans of dystopian reads. Cover Comments: This cover is gorgeous! I love the icy blues and the depth of the cover, and how the model looks like America. Very cool! This one will be out on April 24th, 2012! Also, did you know that the CW (the network with The Vampire Diaries and The Secret Circle) are currently in the process of filming a pilot for The Selection? Check out kieracass.com for all the info! YAY because this book doesn't focus on the catiness and goes for other stuff, I'm even more excited to read it now. I reviewed this one the other week too and I really enjoyed it as well. 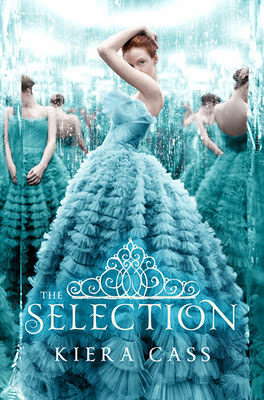 I loved the cover and I really enjoyed watching Maxon and America's relationship unfold. I'm excited for the tv series but unless they make some major changes to the plot I don't get why they market it as the next Hunger Games. Couldn't put it down! I stayed up all night to read it!! SO ADDICTING! recommended to everyone!